Commercial truck drivers operate tractor-trailers and other large vehicles that transport cargo over vast distances for extensive periods of time. Though there are some truck drivers that locally transport cargo to businesses and residences, many drivers take long hauls carrying goods (sometimes hazardous) across state lines. Truck drivers suffer from chronic fatigue for a variety of reasons. Fatigue is caused by using more physical and mental energy and resources than a person actually possesses, resulting in impaired performance. Though fatigue is a major reason for vehicle crashes, the secondary effects of fatigue can also be deadly. Many truck drivers consume loads of caffeine, use over-the-counter alert products, and sometimes even take prescription and illegal drugs to stay awake and combat fatigue. When individuals push themselves past their limits and attempt to make up for it artificially, the likelihood of truck accidents increases. The constant stress truck drivers are under also increases the risk for collisions. According to the U.S. Department of Transportation’s Federal Motor Carrier Safety Administration (FMCSA), the Large Truck Crash Causation Study (LTCCS) reported that 13% of commercial motor vehicle drivers in the study were fatigued at the time of the crash. In 2013, 3,541 truck wrecks killed 3,964 people, which was a drastic increase of an estimated 17% in only four years. Due to the overwhelming increase in vehicular crashes and deaths, the FMCSA announced new safety regulations intended to reduce truck driver fatigue and increase safety. Some of these regulations included limits on the maximum average workweek and required that a break be taken during the first eight hours of each shift. Fatigue impacts truck drivers in ways that can be dangerous or disastrous to themselves and other individuals on the roadways. 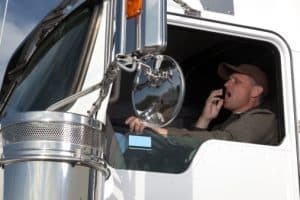 If you have been injured in a truck accident, you should be receiving compensation for your medical bills, property damage, pain and suffering, and more from all responsible parties, including the truck driver. Our Atlanta and Savannah truck crash lawyers at Harris Lowry Manton LLP know how to build a strong case if your injuries resulted from a fatigued driver. Contact our firm at our Atlanta office by calling 404.998.8847, or at our Savannah office at 912.417.3774 to schedule a free consultation today with a trusted Georgia law firm.